Anyone else SUPER ready for Spring, but not such a huge fan of all the itchy throats, runny noses, watery eyes, and stuffy heads?! 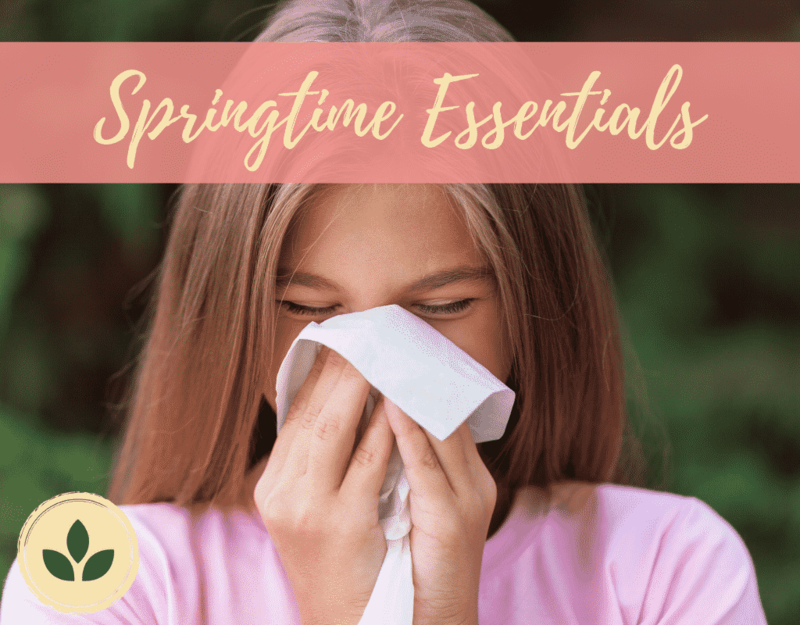 Thankfully, there are lots of natural remedies you can use at home to help support your body against all of those seasonal threats. Below are some of the things that have worked for us! This is my favorite protocol for using your essential oils to help support your body deal with all the pollen and other fun airborne things that come with warmer temperatures. I’m so grateful I have what I need right here in my home! The best part about using oils as a remedy? You can repeat these steps as often as you need without any concern. Bonus! Add 1 drop of each in a mouthful of water. Swish for 15-20 seconds and swallow. You could also add these three to an empty vegetable capsule if that’s more your speed. Diffuse 2 drops of each to keep the air in your home as free from seasonal threats as possible. Check out my YouTube video with more details on how to use this trio this season. Breathe. Also known as “The Respiratory Blend,” I love using this one to help open airways. Simple place a drop or two in the plam of your hands, and inhale deeply through the nose and mouth by cupping your hands in front of your face. You could also make a super-easy DIY salve with Breathe and apply to chest for more serious congestion. Past Tense. This is doTERRA’s “Tension Blend” and is my go-to for all things, well, tension-related. Especially during the Spring months when airborne irritants abound and the pressure in the air changes with different weather fronts, I like to apply this blend to my temples, forehead and back of neck. It has a pleasant tingling feeling and helps to reduce discomfort. It’s not much of a stretch to understand that even those of us who are super intentional with our nutrition and eat mostly well-balanced, whole-foods based diets, are still missing vital nutrients. Unless you are a homesteader (and props to you if you are), chances are that the food you’re eating was grown in soil that has been depleted, or even treater with insecticides and such. That’s where proper supplmentation comes in. I have been taking the LifeLong Vitality pack from doTERRA for over three years and can’t say enough about how amazing they are. One big bonus? 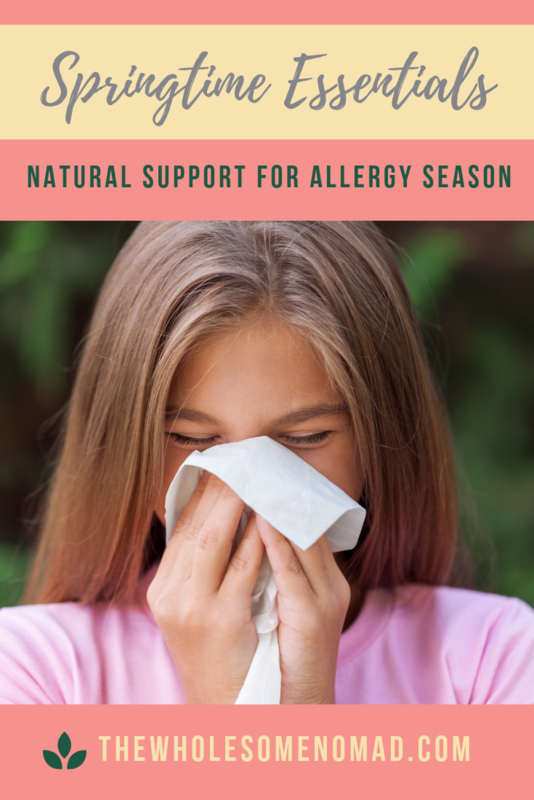 When our bodies have the nutrient-dense supplements they need, we are more likely to have a healthy histamine response to allergens that doens’t make our sinuses go haywire. You can read up on the LifeLong Vitality supplements HERE. I know, I know. We’re all a little over the whole “drink more water” and “you’re basically a cucumber with anxiety” thing. But real talk, drinking enough water has so many health benefits, including support for seasonal threats. A hydrated body ismuch better equipped to flush out all the toxins and things that are driving you crazy this time of year. Consider adding some citrus essential oils to make things more interesting, or grab some sparkling water for a fun twist. Just try to shoot for half your body weight in ounces every day. There’s a lot of research out there that shows that taking raw, organic, locally-sourced honey daily during allergy season can be really supportive. This is because local honey contains small amounts of the pollen from the environment, which works in much the same way as a vaccine by slowly helping your body build resistance to the allergen. Since we’re always on the move, it’s hard for us to define “local” but we try our best and usually like to grab some a farmer’s market or independent health-food store. Full disclosure on this one: I have personally never had to go this route. Thankfully, I’ve had enough success with the rest of these remedies that doing a sinus rinse hasn’t been necessary. But I’m open to it, and I’ve seen it work for lots of my clients, and my husband. This is actually an ancient Ayurvedic practice, and basically uses warm saltwater to flush nasal cavities and remove excess mucus, pollen, and other debris. You’ll want to make sure you aren’t doing this too often, and that you’re being very safe and aware (ie: please don’t use boiling water). Theoretically, this makes a ton of sense to me, so I’ll be sure to update you should the need for this ever arise for me. Also, here’s the link to a brand that has come highly recommended to me. I hope you found something useful here, and wish you a spring season full of flowers and breezy afternoons. Be sure to subscribe to my newsletter to get updates from me (I promise not to spam you), and feel free to reach out if I can suppport you in any way. Hi, I'm Kelley! I am a holistic healthcare leader and wellness enthusiast with a serious case of wanderlust. My husband and I live and travel full-time in our fifth wheel, Bernadette, with our two dogs in tow. I began learning about natural healthcare after being diagnosed with Gastroparesis in 2014, and now work to empower others to take charge of their own healing. When I'm not traveling or playing with my essential oils, I enjoy reading, being outdoors, and attending live theater performances. Disclosure: The content on this Website is not intended to diagnose or treat any diseases. It is intended to be provided for informational, educational, and self-empowerment purposes only. Please consult with your doctor or wellness team if you have any questions regarding the information on this Website, and then make your own well-informed decisions based upon what is best for your unique genetics, culture, conditions, and stage of life.